Brighton, East Sussex, BN1 1RX. 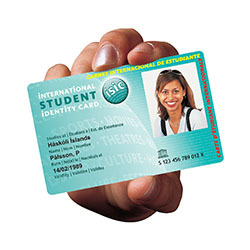 The International Student Identity Card (ISIC) gives you thousands of travel, online and lifestyle discounts at home and worldwide. Enjoy discounts at your favourite high street retailers as well as at restaurants, on guidebooks, travel gear, hotels, tours, attractions, museums, galleries, audio phrase books, CDs & DVDs, takeaways, and even carbon offsetting.